For disgraced TV presenter Martin Sharp the answer's pretty simple: he has, in his own words, 'pissed his life away'. And on New Year's Eve he's going to end it all ... But not, as it happens, alone. Because first single-mum Maureen, then eighteen-year-old Jess and lastley American rock-god JJ turn up and crash Martin's private party. They've stolen his idea - but brought their own reasons. Yet it's hard to jump when you've got an audience queuing impatiently behind you. A few heated words and some slices of cold pizza later and these four strangers are suddenly allies. But is their unlikely friendship a good enough reason to carry on living? Passed on to me by a friend to share with bookcrossers. Picked up from tiggerboing, I am going to offer this as a bookray. I hope you all enjoy the book! If you're the last person on the list you can pass it on anyway you like. Sent off to lauraloo29 today so should be there in a few days. Arrived today. I'm feeling a bit overwhelmed with rings at the moment. But I'll keep them all moving. :) Thank you! This was the second book by this author that I've read. I certainly liked it better than the 1st, but I wasn't overwhelmed by it. It had its funny human moments. I did find myself getting bored by the end. This will be on its way on Monday. Thank you for sharing! Caught today. I can start it right away. I can't get into this book. I've been reading it in my spare time and find myself bored. I have sarahbear's mailing address and will get it in the mail this week. Arrived safely and soundly in Tasmania, Australia today. This book was ok. I skimmed it a fair bit but all in all it was ok. Posting on to Frangipani04 as soon as I have an address. Posting by surface mail to Portugal tomorrow. It's now on the other side of the world. I'll read it soon! Thank you for sending it, sarahbear! I enjoyed the book, but not as much as I did "How to be good". But it was nice reading it, nevertheless. It will go to LindyLouMac tomorrow. Thans for sharing it, purplerosebud. Arrived safely today with thanks to Frangipani04 for sending on to me and to purplerosebud for letting me join the Bookring. I am going to keep this title longer than I normally do as I do not intend to send it on until sometime in January. There seems no point in risking books getting lost in the chaos of seasonal mail. It will be safer here with me! Update 20.12.06 As this book is spending the holidays with us, I have not read it yet, but my husband has! He was not very impressed, finding it rather boring. I wonder what I will think of it? Just taken another look at the amazon reviews, mainly threestar with widely varying opinions. Update: 20/01/07: Apologies but circumstances in my life have kept me from reading and computing recently so I still have not read this. I am going to do so within the next few days and then send it on. I have already contacted the next reader for an address. Update: 23/01/07: I am glad that I read this as it improved the more I got into it. Nick Hornby's very clever style of writing the story took me awhile to get used to. What an odd group Maureen, Martin, Jess and JJ made! Surprisingly this is the only title of this author that I have read, but I am certainly interested in reading other novels by him. Still no response from bigcurlyloz to whom I have sent a couple of pms. In case they are not reaching her I will do an ISO on the forum as well. Update:27/01/07 Having changed jobs bigcurlyloz was going to give this a miss, due to lack of reading time. However purplerosebud has decided that it can become a ray and need not return home! So now waiting for address after all! 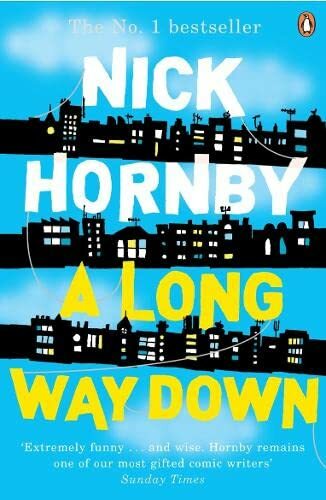 I don't mind Nick Hornby, his other books are ok, and this one was above average. It's very easy to skim read, a habit I find myself in when things aren't written in a way I want to savour on need to concentrate on. However, I liked the premise and "The Group" were an interesting set of characters. I'm glad I read it - thanks for letting me keep hold of it until I had the time purplerosebud. This is now reserved to RABCK to someone at the UK UnConvention! I lent this to my dad, and we both agreed it wasn't amazing, however, its now ready to travel onwards. Taking to the BookCrossing BBQ at Coate Water today.